Edward Jacob Schwert was born in Buffalo, New York, on September 15, 1889. He was baptized on September 22, 1889, by Father Huber of Saint Boniface R.C. Church, 124 Locust Street, Buffalo, NY. On September 18, 1909 at Saint Nicholas R.C. Church in Buffalo, NY, Edward married Lucretia (= "Lulu") (née Sykes), a daughter of George and Hannah (née Fickling) Sykes. Lulu was born in Pennsylvania on October 22, 1885. On November 5, 1909 at Saint Nicholas R.C. Church, Lulu was baptized -- perhaps as conversion to the Catholic faith. As of the 1910 Census, Edward and Lulu resided at 364 Fougeron Street in Buffalo. 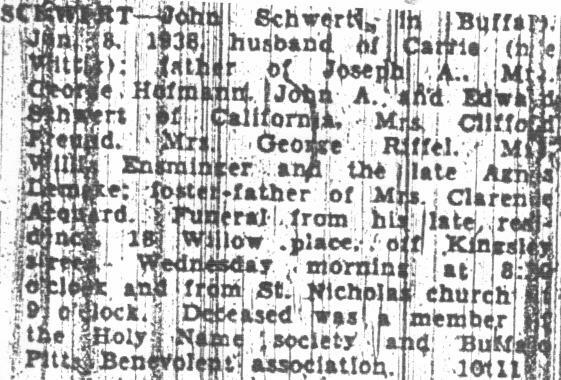 The 1938 obituary of his father John states that Edward settled in California as an adult. We have not been able to locate any subsequent information about Edward. The 1940 U.S. Census shows Lulu divorced from Edward and residing in Los Angeles, California. She died there on January 6, 1965 and is interred at Forest Lawn Memorial Park in Glendale, California. ***: Born ****; died ****. Baptismal Record: Edward Schwert, born on September 15, 1889. Baptized on September 22, 1889, at Saint Boniface R.C. Church, Buffalo, NY. (In some photocopies of this document, the baptismal record has been incorrectly hand-corrected by the Buffalo Diocese to "1884"). 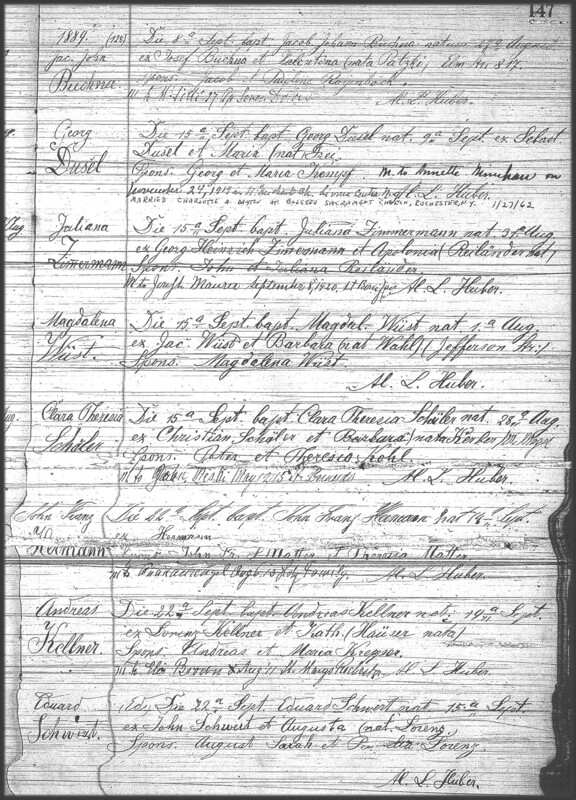 Census Record: 1910 U.S. Census record for Edward J. and Lulu (née Sykes) Schwert, 364 Fougeron Street, Buffalo, New York.